Kurker recently returned from Europe where he was a member of the U.S. Select U-18 team that played in the 2011 Ivan Hlinka Memorial Tournament along with 2013 recruit Danny O’Regan. He earned a spot on that squad with strong showing at the Select 17 development camp in Rochester (7-1-8, tied for sixth in scoring). He also tallied two assists in the Select 17 all-star game. Kurker, who will be St. John’s Prep’s captain next season, scored 20 goals and 17 assists last year and has 66 points over three seasons. In the 2011 Massachusetts Super 8 tournament, his two-goal performance in a 3-1 win against Catholic Memorial lifted the Eagles into the championship game. St. John’s fell in the final to Malden Catholic on 2013 recruit Brendan Collier’s overtime goal. 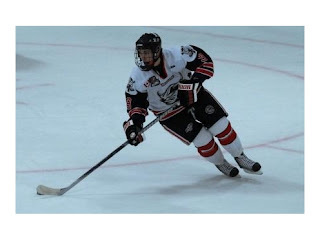 Kurker, who also skates for the Little Bruins midget team and the Beantown Bullies tournament team, is one of three future Terriers who made the NHL Central Scouting 2012 futures list. He received a B ranking, as did Collier. 2013 recruit Robbie Baillargeon received an A ranking. USHR also reports that NTDP forward Cam Darcy, who recently decommitted from Northeastern, will make a final choice for his new committment between BU and BC during the next month. The South Boston native recently attended the NHL RDO camp in Toronto for top 2012 draft prospects. Before joining the USA NTDP program where he scored 9 goals and 13 points last season, Darcy skated for former Terrier Dan Donato at The Dexter School. Three Terriers are participating in this week’s IIHF Twelve Nations Tournament in Finland. Senior Kasey Boucher is on the U.S. roster while senior Jenn Wakefield and Catherine Ward, who played for last year’s NCAA finalist BU squad, are skating for Canada. One day shy of his 35th birthday, former Terrier, NHL and Team USA standout Chris Drury made his retirement from hockey official. Earlier this summer, Drury and the New York Rangers agreed to a buyout of the final year of his contract and he considered continuing his career despite a lingering knee injury .However, today Drury made his decision public through a media release from the NHL Players Association. The only player to win both the Hobey Baker Award as college hockey's top player (1998) and the Calder Trophy as the NHL's top rookie (1999), Drury also won a Stanley Cup with Colorado early in his 12-year NHL career and the NCAA championship as a BU freshman in 1995. His NHL totals include 255 regular season goals and another 47 in the playoffs where he often delivered his best efforts. In four years at BU, "Captain Clutch" became the school's all-time goal scoring leader with 113 to go with 101 assists. He played in three Frozen Fours and two national championship games and was a two-time All-American. He was elected to the BU Athletics Hall of Fame in 2003. Drury suited up for the U.S. in three Olympic games, winning silver twice, and was part of the U.S. squad in 2004's World Cup of Hockey. He first came to national attention as the winning pitcher for Trumbull, Conn., in the 1989 Little League championship game, ending a five-year U.S. drought. Dallas Stars draft pick (2009/2nd round) Alex Chiasson talked with ESPN Dallas about his second summer attending Stars' development camp and his plans for his junior year at BU. -Chiasson photo gallery by Melissa Wade. Jason Lawrence, who led the 2008-09 national champion Terriers in goal-scoring with 25, has signed on with the Manglerud Stars of the Norwegian Elite League. Last year, he played for Eindhoven Kemphanen in the Netherlands Elite League, producing a 30-28-58 line in 45 games. 2012 recruit Marc Hetnik, Jr., talked with the Vernon Morning Star about his decision to play a season of junior with the BCHL Vernon Vipers. Adam Clendening and Charlie Coyle made this week's roster cut at US Junior National Evaluation Camp (photos). Matt Nieto did not. USA Hockey will hold a final camp in December and players who didn’t make the cut or were not at the evaluation camp could be invited to the final camp. Former Terrier captain and current New York Rangers Associate Coach Mike Sullivan is one of the special evaluation camp coaches. Camp ends Saturday following Team USA's game against Sweden. Despite losing just one game, the U.S. Select U18 team finished fifth in the Ivan Hlinka Tournament. 2013 recruit Danny O’Regan was among the top U.S. scorers, with 2-3-5 in four games. He scored a goal and an assist in the team’s final game a 3-1 win against the Czech Republic, duplicating his effort in team’s 5-4 OT win over Russia. Former All Hockey East blueliner Bryan Miller will return to the ECHL Alaska Aces for a fifth season. Miller, who quarterbacks the team’s power play, helped lead the Aces the leagues’ Kelly Cup this past Spring. Isabel Menard, who has transferred from Syracuse to BU, talked with the Ottawa Citizen about her decision to become a Terrier. This week she is at development camp for Canada’s U-22 team, along with three BU teammates, Marie-Philip Poulin, Tara Watchorn and Jennelle Kohanchuk. In an intersquad game Thursday, Menard, a distant relative of Mario Lemiuex, recorded two assists for the blue team while Watchorn scored a goal. Menard, Watchorn and Kohanchuk won gold medals with Canada’s U-22 Team at the 2011 MLP Cup in Switzerland. -- Terrier Tales: The Vagabond Champions is Scott Weighart's chronicle of BU's first NCAA championship team, forty years ago in 1971. --Links: United States of Hockey focuses on USA Hockey, U.S. National Teams, American hockey prospects, college and junior hockey, and the growth of the game. On the first day of international competition at U.S. Jr. National Team evaluation camp, sophomores Adam Clendening (photo) and Charlie Coyle —and members of last season’s Hockey East All rookie team, played important roles in U.S. wins. In a 4-3 win for USA Blue over Sweden, Clendening scored his team’s second goal midway through the game and later assisted on the overtime game-winner. Coyle registered a pair of assists in USA White’s 5-3 win against Finland. 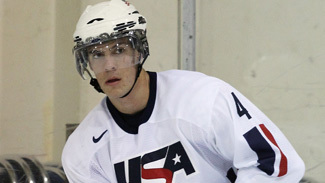 Sophomore forward Matt Nieto also skated for USA White. Also in international play, 2013 recruit Danny O’Regan is a member of the USA Select U-187 team playing in the Ivan Hlinka Memorial Tournament in Slovakia and the Czech Republic. Another standout from last year’s freshman class, Sahir Gill, is serving as an instructor at The Champions Hockey School in British Columbia. Playing for the Providence Bruins last year, former Terrier Colby Cohen was reunited with Carter Camper, his junior hockey teammate with the Lincoln Starts. Camper, a star forward with Miami Univ., was a Terrier opponent in the 2009 NCAA championship game that BU won on Cohen’s OT slapshot. The College Hockey Blog has begun a series of article previewing its choices for the top 16 teams for the upcoming season. College Hockey News reports that Versus cable, which will soon be rebranded as NBC Sports Network, is negotiating to air a package of college hockey games that would include Hockey East games. Goalie Kerrin Sperry and defenseman Kasey Boucher will be in Blaine, Minn., this week to participate in USA Hockey’s Women’s National Festival. BU has announced its roster for 2011-2012, which includes four newcomers: forwards Cason Hohmann and Evan Rodrigues (photo), defenseman Alexx Privitera and goalie Anthony Moccia. All are freshmen, except for Moccia, a sophomore who was a practice goalie for the Terriers last season. Prior to BU he was the starting goalie for Massachusetts prep school Buckingham, Browne & Nichols. The announcement includes thumbnails of the first-year players and comments on each from head coach Jack Parker. Returning as a red-shirt freshman is Yasin Cisse, who injured in the first game he played and missed the rest of the season. Former BU standout Keith Tkachuk has been named to the U.S. Hockey Hall of Fame’s 2011 class and becomes the 8th former Terrier selected. Previous selections were Jack Garrity, Jack Kelley, Tony Amonte and 1980 Olympians Jim Craig, Mike Eruzione, Jack O’Callahan and David Silk. 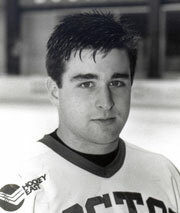 A member of BU’s 1991 national runner-up team, Tkachuk scored 538 goals and 527 assists in 1201 NHL regular season games. Binghamton Senators assistant coach Steve Stirling, recuperating from emergency heart surgery, had his opportunity to spend some time with the Calder Cup, which the Senators won in the AHL playoffs. A former college coach at Providence, Stirling captained BU’s first NCAA championship in 1971, 40 years ago this past Spring. Former Terrier captain Kevin Shattenkirk, traded from the Avalanche to the Blues during his standout rookie season, will live guest between 6:30 to 8pm Wednesday, August 3, at Hotshots in Maryland Heights, MO, to kick off Verizon Wireless Hockey Nights. The Pittsburgh Post-Gazette looked back on the career of former Penguins and BU star John Cullen, who celebrated his 47th birthday yesterday. Cullen, a Terrier from 1983 through 1987 is BU’s all-time scoring leader with 241 points (98-143). 2013 recruit Brendan Collier (video) is participating in the annual Hockey Night in Boston tournament before beginning his senior season at Malden Catholic. Collier scored the game-winning goal in this past season’s Super 8 championship game. As many observers expected following the QMJHL draft, Adam Erne has decommitted and will play major junior hockey for the Quebec Remparts.